Shoshanah Tarkow is a scholar, conceptual artist, director, and theatre-geek turned self-taught techie, working in the interstices between real/virtual, human/nonhuman, analog/digital. 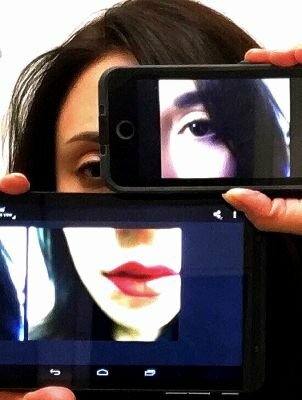 Her artistic digital interventions explore the way art, community, consciousness, and experience function in a digitally mediated world. Shoshanah’s work creates spaces and opportunities for dialoging about ethics and integrity online, and the need for digital mindfulness. She is the creator and developer of the Digital Happening Project (a community-sourced, durational, artistic experience modeled after Allan Kaprow’s 1960’s Happenings and presented on social media). Shoshanah is a co-founder, resident director, and digital content curator for the immersive theatre company Like Fresh Skin. In that capacity, she works on developing interactive and immersive theatrical experiences which utilize presentation techniques from museum and media studies, as well as traditional theatre. Shoshanah received her BFA in Theatre Studies from Adelphi University and her MA in Performance Studies from New York University. To find out more about the Digital Happening project check out DigitalHappening.org. "The artist is always engaged in writing a detailed history of the future because he is the only person aware of the nature of the present. […] The ability of the artist to sidestep the bully blow of technology of any age, and to parry such violence with full awareness is age-old. […] The artist is the man in any field, scientific or humanistic, who grasps the implications of his actions and of new knowledge in his own time. He is the man of integral awareness." I believe technology is humanity’s latest frontier; the internet, its most recent form of avant-garde. My scholarly and practice-based research exist in the interstices between real and virtual, analog and digital. As a technological explorer with a background in the performing arts, I stage artistic digital-interventions exploring the performance of identity online, the digital preservation of live performance, and the affective potentialities of digital technology. My work creates a space for dialoging about community, identity, and ethical responsibility—both online and IRL. For the artist, it is no small responsibility to live up to both McLuhan and Beckett’s expectations. Beckett is correct, the world is certainly a mess right now, but I do not believe making accommodations is the answer. The transition from analog to digital is a messy one, wrought with feelings of nostalgia and a glorification of “simpler times.” The artist’s task is not to accommodate the mess, but rather to challenge the status-quo by harnessing the world-making power of new-media and digital-technology. It is only through actively staging artistic interventions, rather than “opting-out,” that artists may hope to sidestep the bully blow of technology and parry such violence with full-awareness. This approach to technology is not idealistic. This approach to technology is not naively optimistic. This approach to technology—my approach to technology—is both realistic and proactive.